The creation of a flagship Sainsbury’s supermarket has dominated the media headlines about one of the largest developments in the Nine Elms regeneration area. But the residents of the 645 studios, one, two, three and four-bedroom apartments and penthouses nearing completion at Nine Elms Point will have more on offer than the opportunity to pick up groceries in an 80,000 square feet store. The homes at Nine Elms Point – the first of which will be ready for occupation this summer – are arranged over seven metallic-style buildings designed by leading architects Broadway Malyan, including a landmark 37-storey tower. Most of the ultra-modern homes have a balcony or terrace offering views across the River Thames or over the acre of communal gardens Nine Elms Point is built around. This means that although Nine Elms Point is just minutes from London’s West End and in easy reach of the city’s business districts, it has been designed as an urban retreat. In fact, the developer says it “focused on providing an abundance of green open spaces, including large landscaped courtyards and raised gardens, some with views extending across London”. Inside the luxury homes, every property has generously-sized open-plan living spaces and large windows creating living spaces that are flooded with energy-efficient natural light. Luxury features such as underfloor heating and wine coolers sit alongside contemporary finishes such as glass splashbacks and quartz worktops. Not only that, each home comes with good storage spaces and a 10-year NHBC warranty. A 24-hour concierge, residents’ lounge, private dining room, fitness suite, viewing room and business lounge also come part of the package, while car parking is available at an additional cost. But the real attraction of a home at Nine Elms Point is the development’s location. At the western end of Nine Elms, just off Wandsworth Road and close to Vauxhall Tube station in Zone 1 on the Victoria line, Nine Elms Point is seconds from Vauxhall Park and the cafes and restaurants on Lambeth Road, while the 200-acre Battersea Park is less than half a mile away. Residents will not have to wait for the completion of the Nine Elms regeneration to access local facilities being built in preparation for the opening of the new US Embassy, which will include the opening of schools, health centres and big-brand retail outlets. 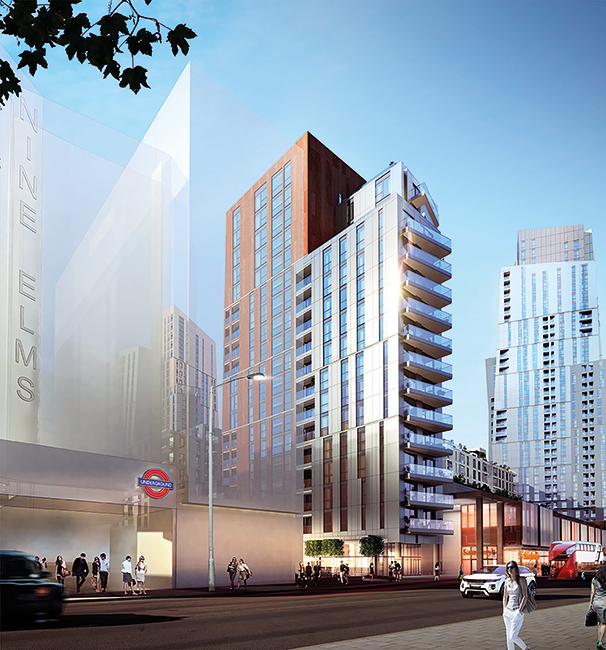 However, Nine Elms Point – which will also include 27,000 sq ft of local shops, restaurants and office space when the development is finished in late 2019 – is the closest development to the new Nine Elms Tube station that is due to be completed by 2020 and will provide access to Northern line. The 20,000 new homes being built in Nine Elms will become some of the most sought-after in central London as s the capital’s new diplomatic district grows in popularity. Like Canary Wharf, the value of homes in Nine Elms will rise as demand for modern, luxury apartments outstrips their supply. For further details of homes available at Nine Elms Point and other developments at this exciting riverside location, use the form to contact Garton Jones today.